Design t shirts cheap online today and have your shirts in a few days, not weeks. There is no such thing as free shipping. The last time I checked UPS and the Postal Service were not willing to ship the shirts I printed to a client for free. Personally when any business says shipping is free I look at that as a back handed way of them making it appear I’m getting a deal when I’m really not getting any such thing. If they want to simply pricing and give me one number, I just assume they say shipping is included. At least that way I know they aren’t trying to sell me on something that just isn’t true. When it comes to the big screen printing shops online, not only are they trying to sell you on free shipping which we know is not true, but they have additional shipping costs that they wrap into the final price of the custom printed tees. You can design t-shirts cheap but what you really don’t know is this. If you go online and design your shirts and order them from Company A. Company A doesn’t actually print your shirts. They drop ship the shirts to company B who actually prints the shirts and Company B is the company that then ships them to you. There is nothing unusual about that with the exception that the company you are buying your custom t-shirts from never actually sees the shirts you ordered. What’s more is that Company A ships custom printed boxes with their logo on it to Company B to box your shirt order in before sending. So there is an added cost to have custom boxes printed up and there is additional shipping to have Company A logo boxes shipped to Company B. What’s this mean? First, it means you are paying for all that additional shipping and the cost to print a box with Company A’s logo on it. So you are paying more than you need to for custom t-shirts. It also means that if you order is randomly sent out to any given printer Company A uses to print the shirts, quality control has to suffer a bit. At the end of the day you are receiving an order that costs more which may be a high quality print job. But you also risk something going wrong when so many different hands are involved in a particular order. And make no mistake, all of those hands that are involved in the custom boxes, printing, shipping, are all getting a piece of that pie which is your order. You can design t shirts cheap by using a local company. If they have been in business for any significant length of time you can be assured their quality is the highest possible. Their customer service is probably pretty good, and their prices and turn around time is competitive. A printing company who has been in business for a significant length of time is going to have all their printing done in-house under one roof. So the quality and consistency is going to be the same order after order. 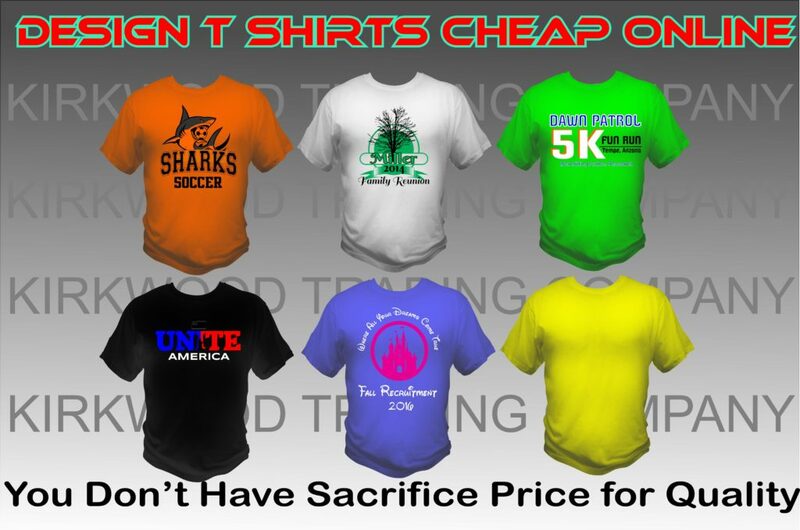 At the end of the day you are paying less for a high quality custom t-shirt. Even if you have to have shirts shipped to you from one of these companies. THere are still fewer hands involved in your order which even with shipping, keeps your price significantly lower than the larger online companies. So you can design t shirts cheap and not sacrifice price for quality. Companies who are business for many years aren’t in business that long because of luck. They are in business because they provide a superior product at a fair price and chances are their customer service is impeccable. The word cheap is often times confused with poor quality. These days people want something cheap, meaning they don’t want to pay more than something is worth or valued. When it comes to custom t-shirts you can design t shirts cheap and cheap meaning the latter. The quality can be superior with out the superior price.